Washington University is a well-funded research institution where researchers have the funding available to purchase the latest and best lab supplies on the market. In 2012, the NIH awarded Washington University in St. Louis $381 million in life science funding, while the university has received $318 million in NIH grants so far this year. For more funding statistics on Washington University in St. Louis, including a departmental breakdown of NIH funding organized by department name, number of awards received and total funding awarded, please read our blog Increase Lab Supply Sales at Washington University, St. Louis Event. By purchasing a table at our Washington University event in St. Louis through early registration, you will get the most value for exhibiting with Biotechnology Calendar, Inc. Our events bring in hundreds of active researchers interested in learning about the latest and best lab products you have available. By taking just a few hours out of the day to discuss problems in the lab with researchers, professors and post docs, you may help attendees find that missing piece of equipment in their research process. Perhaps your company provides a product or service that will save researchers time, money or waste. Meeting researchers at our event is the easiest way to find out whether you can assist them in their work. Researchers trust the event staff and sales reps at our trade shows because of our university contacts, and they also know that there is a tradition of Biotechnology Calendar, Inc. hosting life science marketing events in St. Louis. This 2014 trade show will mark the 15th year we have hosted a life science marketing event for Washington University researchers in St. Louis. If you are a lab supplier interested in life science marketing opportunities and selling lab equipment in St. Louis, we invite you to exhibit at our St. Louis BioResearch Product Faire™ Event on March 20th, 2014. 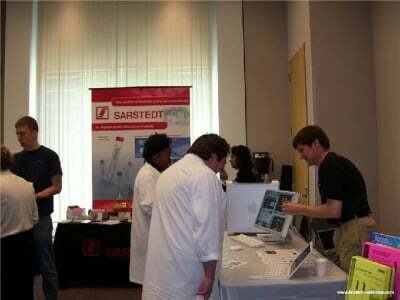 In 2012, the St. Louis BioResearch Product Faire™ Event attracted 348 attendees. Of these attendees, 121 were purchasing agents, professors and post docs, and 50 were lab managers. These life science researchers, purchasing agents and lab managers came from 29 different research buildings and 47 departments around campus. Biotechnology Calendar, Inc. is a full service science research marketing and events-planning company that organizes life science marketing events at top research institutions nationwide. If you are interested in selling lab equipment and life science marketing opportunities closer to home, we encourage you to view our 2014 calendar of events. For more funding information on Washington University in St. Louis, or to learn more about our St. Louis BioResearch Product Faire™ Event, click on the button below.